Black and white photograph of Antonio and Ninetta Mascioli, date unknown. 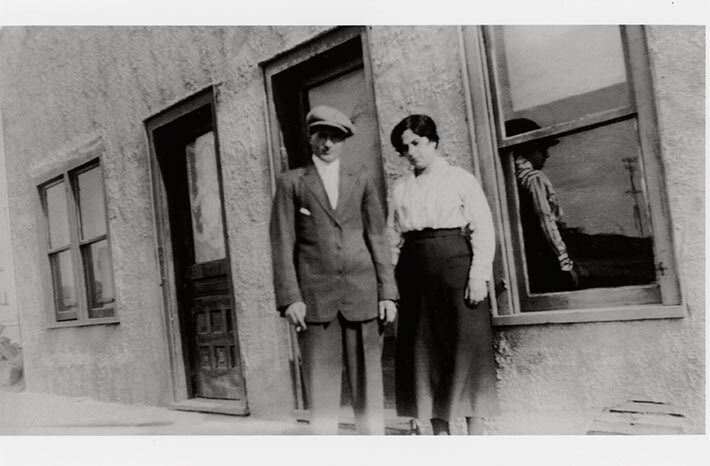 The married couple are posed outside of their home. The location of the photograph is not known. However, the style and construction of the building suggests it may be Italy (stucco finish on exterior walls). The couple were married by proxy, and Ninetta joined her husband in Montreal where they first resided.They later settled in Timmins, where they raised their family. As the date is unknown, it is also difficult to determine the location of the photograph.